Nowhere Near Here is a stop animation by Pahnl. He has been stencilling since 2003 and his whole aim is to make his work interact with it’s environment (which he definitely does in the piece below). 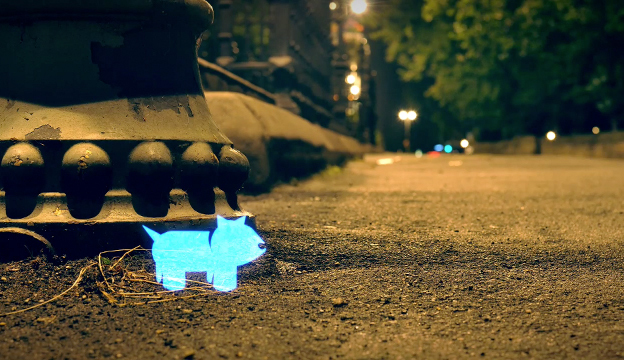 In this video we see a combination of light with stencils and long exposure photography to tell the story of a dog running around the city at night. Very much a technical video, taking over 300 hours to create and involving more than 200 stencils. It’s particularly inspiring to know the amount of effort that has gone into this, you can see it in the finished piece. Give it a watch below and comment with what you think. For those of you that may be interested in prints, a selection of film stills from ‘Nowhere Near Here’ are currently available to purchase on his webstore.